A cordless string trimmer offers complete convenience and easy maneuvering since there is no use of a cord or even the need of fuel. If you are looking to replace the older temperamental gas weed eaters of the past the Makita XRU07PT 18V X2 LXT Lithium-Ion (36V) Brushless Cordless String Trimmer Kit (5.0Ah) is a nice option. It is a high performing string trimmer that can easily handle even the heavy weeds and grass. With up to one hour worth of run time when using the lower speed settings, this Makita XRU07PT delivers a reliable cutting experience. Even if you crank the speed up, there is plenty of battery life in this unit to complete your maintenance duties. Discover more features and benefits of this string trimmer here below. There is no longer any convincing argument today for any homeowner to buy a gas powered string trimmer. This Makita XRU07PT 18V X2 LXT Lithium-Ion (36V) Brushless Cordless String Trimmer Kit proves that point even further by offering top class efficiency and convenience. It is quieter and practically needs limited maintenance in its lifetime. Setting up the Makita XRU07PT 18V X2 LXT string trimmer kit is very easy as everything you need comes neatly packaged in the box. Make sure you select the full kit when buying as there is also an option to only get the bare tool. Most users were very happy with their purchase and they report that it is very durable. This cordless string trimmer runs on a brushless motor and the power production is quite amazing. It can cut through tall grass and tough weeds easily, without any choking or stalling. While it may seem light, it has the potential to send small rocks and debris flying around, so wear the proper gear during operation. In terms of usability and balance, the motor has been placed strategically on the head to ensure improved maneuverability. The batteries are also placed on one end to counterbalance the motor and this gives you more accuracy when cutting. In addition to that, you can even add on some shoulder straps to make it more comfortable. A major issue related with using cordless trimmers is the battery life, especially when tackling heavy yard work. You will be pleased to know that Makita’s XRU07PT features two long lasting 18V 5Ah batteries in the kit. Besides having the ability to charge quickly, these batteries can deliver impressive run-time and power on the highly preferred 18 volt battery platform. 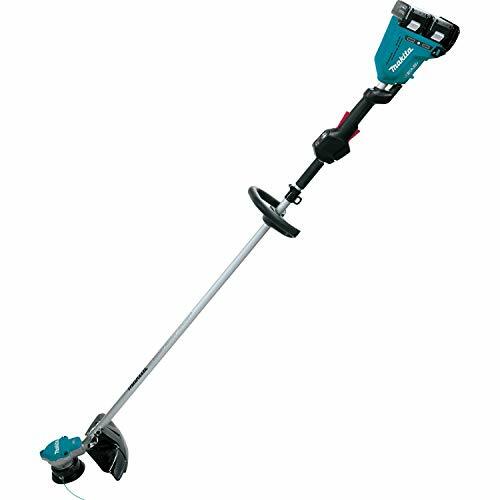 The Makita XRU07PT 18V X2 cordless string trimmer is definitely worth its higher price since you can perform a wider variety of tasks with it simultaneously. This is made possible by the two-speed settings available on the device. You can either go slowly if you are dealing with light grass, or high if you are tackling heavier weeds. This means that you have more flexibility when doing your regular yard work. When it comes to keeping your cordless string trimmer clean, you will discover how easy it is to clean this Makita XRU07PT. The motor is securely sealed in cast iron covering since the brushless motors do not need venting like regular electric motors. In effect, the unit can be safely hit with your water hose for a fast clean up. The DEWALT DCST920P1 20V MAX 5.0 Ah Lithium Ion XR Brushless String Trimmer delivers a similar cutting performance and battery life as compared to this Makita XRU07PT, all while being significantly cheaper. However, there is a major drawback of this DEWALT trimmer and that is the fact that it is not well set up to carry out edging tasks. Furthermore, there are quite a number of owners who are not happy with its durability, with many people complaining that they are already using replacement models. So, if you want durability, you will have to pay more and get the Makita version. The other solid alternative to this Makita cordless string trimmer is the DigiPro G-MAX 40V Cordless String Trimmer and Blower/Vac, 4Ah Li-Ion Battery by GreenWorks. This quiet and lightweight string trimmer is also brushless, which means better efficiency and a longer lifespan. Nevertheless, since it features a 4Ah unlike Makita’s 5Ah Li-Ion battery, it means the cutting time will be a bit shorter. Overall, this Makita XRU07PT 18V X2 LXT Lithium-Ion (36V) Brushless Cordless String Trimmer Kit (5.0Ah) is an effective trimmer that is loved by both professional landscapers and homeowners alike. It feels great to hold in the hand and the overall build quality is quite good. It is definitely much lighter compared to its competitors, which is necessary when carrying it around for cutting wide areas of land. The brushless motor and adjustable speed settings help it handle all the common weed and grass cutting tasks at ease. The battery life is yet another notable feature of this cordless string trimmer, since you can get up to one hour when cutting at low speed. In conclusion, the Makita XRU07PT is another great string trimmer from a reputable brand that is known for top quality and durable products.